HOTEL AROMA EXECUTIVE is centrally located in the heart of Panaji, the capital of Goa, 27 KMS from the Dabolim Airport, 12 KMS from the Karmali Railway Station and 1 KM from the Panaji Bus Stand. 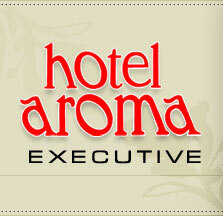 HOTEL AROMA EXECUTIVE is a budget hotel, ideal for families and business executives. The Rooms are modern, keeping in mind our guests needs and comforts. They are tastefully done, simple, functional , neat, clean and well lit. The Rooms are air conditioned, with colour cable TV, mini bars (only in select rooms), electronic safes, hot and cold running water and comfortable spring mattresses of international standards.We are Wi-Fi enabled hotel. The Panaji Church a beautiful edifice blessing the city in more ways than one is only about 200 meters away. The Mahalaxmi mandir is just 500 meters away. HOTEL AROMA EXECUTIVE faces a beautiful garden maintained by the Panaji Municipal Corporation.Travel Agents, Pharmacies, Designer wear shops. Leather, sports goods footwear, stationery and courio shops are all at a distance of a few-steps. There are a lot of Cafes and restaurants within 100 meters of the hotel. Rickshaw stand is only 50 meters away. The Mandovi River promenade a beautiful walkway is just 100 meters away. We have Queen Paulo Travels counter in our premises for your convenience for sight seeing tours and bus tickets motorcycle hire and taxis.